Rubber is everywhere! Have you ever stopped to consider how many rubber parts are in your car? Or your dishwasher? Or the airplane flying you away to your dream vacation? So many items that we use every day are composed of thousands of rubber parts of varying size and shape. Each of these components plays an integral role in how that item functions and performs down the road. Rubber is truly a unique material. It is elastic yet strong, smooth yet tacky, lightweight yet insulates and protects, and soft yet abrasion-resistant. Rubber stretches and compresses, waterproofs no matter its thickness, and remains flexible over a wide temperature range. What’s more amazing is that any of these properties can be optimized by compounding rubber articles using select elastomers, fillers, processing aids, activators and vulcanizing agents. Rubber’s versatility is only limited by one’s imagination. 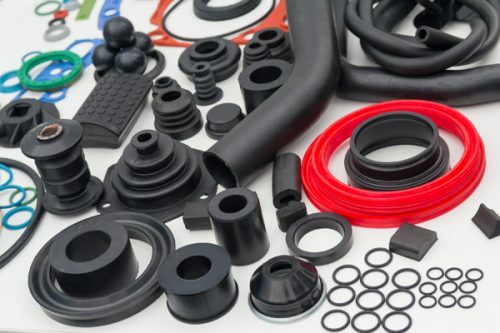 It’s no wonder rubber is so valuable in many industries for an unlimited number of applications including vibration and sound dampening, sealing, electrical and thermal insulation, chemical transport and waterproofing. Rubber is quite versatile. It can be pushed, pulled, stretched, compressed, or heated to fit in, on, or over anything. Rubber is inherently tacky and can be squeezed into tight areas, but it is naturally slip resistant making it difficult to install, remove or manipulate. It’s not unusual for rubber parts to slip during assembly and not go exactly where they’re intended: an O-ring may get twisted, a heater hose may not be fully inserted, a gap can appear in a waterproof seam. Successful assembly can be tricky. Improper assembly can lead to a multitude of problems including destroyed parts, warranty claims, recalls and worker fatigue or injury. So, why has rubber installation always seemed to be an afterthought? Coating rubber parts with a liquid to provide lubrication prior to assembly helps avoid some of the aforementioned problems. Traditionally, lubricant choice was based on convenience. Line workers would find whatever substances were in the plant and use them for rubber assembly. Some common choices were soap and water, alcohol, gasoline, motor oil, petroleum jelly and silicone spray. While these products do provide lubrication, they also introduce health and safety risks and may damage rubber parts. To protect product integrity and ensure environmental and worker safety, engineers became involved in the lubricant selection process. 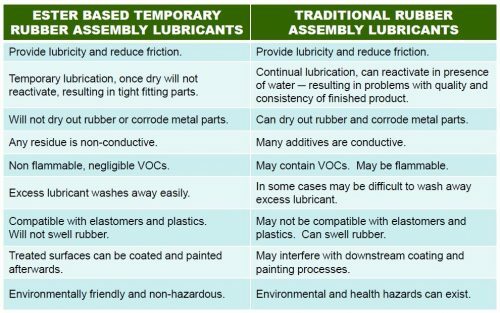 Design Engineers, Lubricant Engineers and Ergonomic Engineers all take part in choosing the proper lubricant for each assembly process. Design Engineers are concerned with design tolerance, part breakage, production rates, dry time and material compatibility. 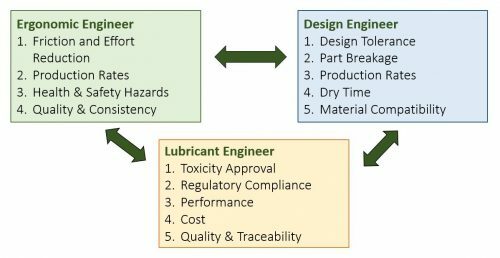 Lubricant Engineers are more focused on performance, cost, regulatory compliance and toxicity approval. Ergonomic Engineers remain focused on worker safety and consider factors such as friction and effort reduction, production rates, quality and consistency, and health and safety hazards. As a result of these concerns, lubricants are now included in the initial design phase of many engineered parts. In addition to detailing all facets of the part, material specifications now include the accompanying assembly lubricant and its proper assembly technique. Design stages include a battery of lubricant trials and choices are made based on performance, cost and safety. More and more frequently, water-based lubricants are the product of choice. 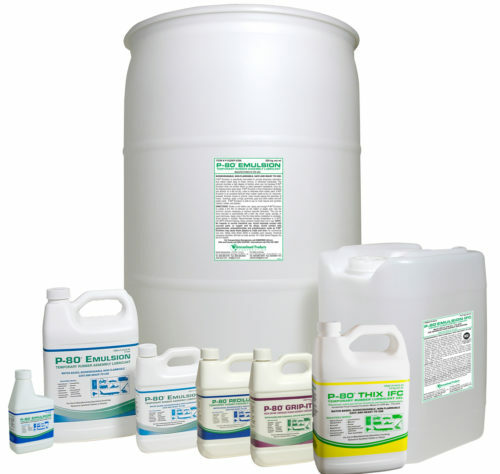 A well-formulated oil-in-water emulsion overpowers the low surface energy of rubber. This means the emulsion completely coats the surface without beading up. The oil portion has a natural affinity to the rubber surface and the water is exposed to the environment, facilitating evaporation. Only a thin layer of oil contacts the rubber, an ample volume for successful assembly. The thin coating ensures no residue, temporary lubrication, no compatibility issues and a safe working environment. Once assembled, the water evaporates and the lubrication ceases. Water-based lubricants can be formulated with different properties making them ideal for essentially any assembly application. Lubricant properties such as viscosity, dry time, biodegradability, compatibility, and surface residue (such as adhesiveness) are all taken into consideration. Engineers can now choose a lubricant tailored exactly to their needs before production begins, eliminating many of the problems that used to occur after assembly. The lubricant selection process has evolved so that it is now a true collaboration between Design, Lubricant and Ergonomic Engineers. Learn more here about this multi-disciplinary engineering approach to selecting assembly lubricants.